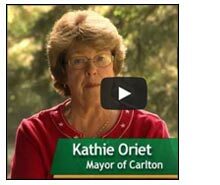 Hear what community leaders are saying about the WM Stewardship Plan. Video Overview | In the News | Stewardship Committee | Get Involved! Here’s a map showing the WM-Riverbend property, located three miles west of McMinnville. The parcels in green are the Stewardship Lands that WM is making available for community use. Together, these parcels include 450 acres. The Stewardship Committee has approved one project (collaborative farming) to date and continues to invite new proposals. The collaborative farming project is scheduled to launch on the 59-acre parcel (lower right corner of the map) in 2015.